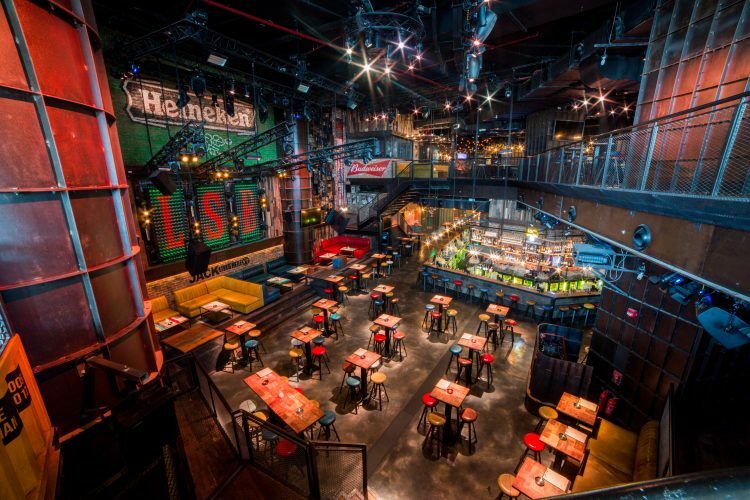 Every good action sequel should be bigger and bolder with more special effects – and the second incarnation of Lock, Stock & Barrel in Dubai is no exception. With 2.5x more floor space than the original as well as expanded dining facilities and a pool deck terrace bar this latest realisation shares the DNA of the original project but has been substantially expanded at all levels. The venue is a combination of detailed architectural lighting and dynamic show lighting allowing it to transition from a warm pub feel through to live music, sports events and late night dancing. There are several hundred LED filament lamps with specialist dimming giving a retro vibe, a combination of LED wall uplighting lighting, recessed led tape, profile and pin spots – all with colour mixing to allow for the variations in atmosphere that the venue demands. New for this installation where Glasson Electronics LED Festoon over the expanded food court area, custom Studio Due 4000k IP rated LED bars for the exposed kitchen counter and live cooking stations and the Music&Lights MiniEclipse LED spots with wireless dimming for architectural and feature highlights. We also re-created the trademark “bottle wall” LED matrix of 600 blinder pixels with half beer bottles in front as a dramatic feature piece which carries the venue brand during the day then comes to life as a backdrop for the house bands, DJ and live performances at night. The venues interior design is rich in textures – from exposed brickwork to used railway sleepers, green foliage and recycled shipping containers. The lighting design works to enhance this character with theatrical flair in every area – all controlled on the same MA dot2 console. The Bottle Wall feature is driven by Madrix which in turn has dmx control from the dot2 to fully exploit Madrix’s sound to light alongside operator driven programming. The entire lighting rig is LED including all architectural and show lighting maximising the power to output ratio and minimising maintenance and running costs. 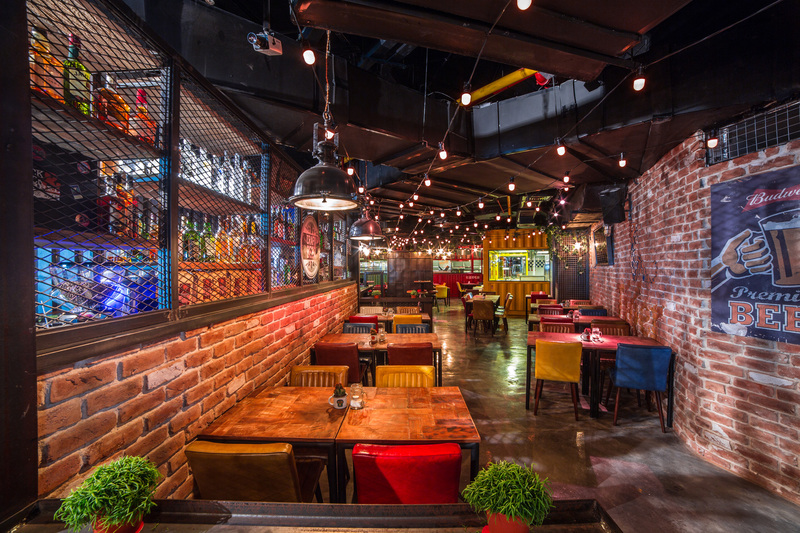 MagicFX Smoke jets are built into the bottle wall feature and the bars and used principally for the trademark “Lock Stock Lock Down” which marks the commencement of time limited drinks offers and delivers an immersive lighting, sound and effects sequence to time coded playback. By consolidating control from the dot2 console the resident operators can manage every aspect of the visual presentation and quickly respond to the changing programme of events – bathing the venue in colours to match team colours on match days and recognising festive and special events on the calendar. The show lighting is a comprehensive range from Music&Lights – with PixieBeams, Luma 700 LED Profiles and Diamond 7 Zoom Wash heads for a rich pixel based composition. 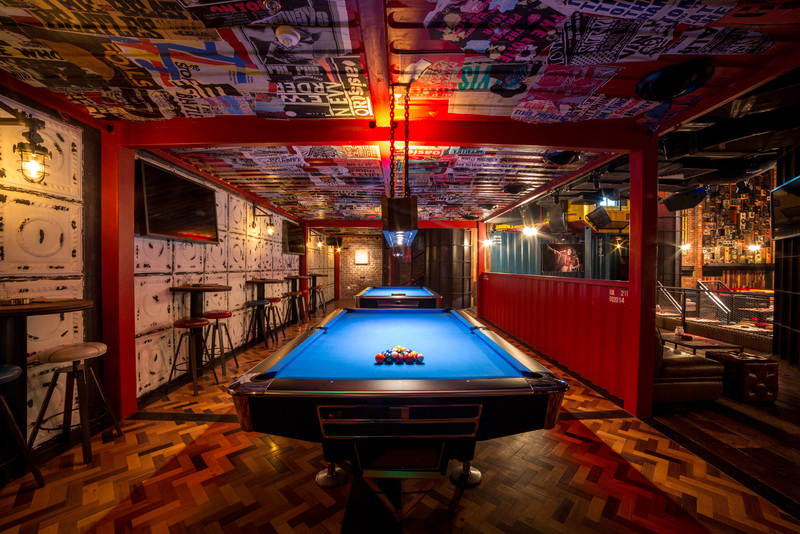 The venue also features large TV’s and a Panasonic projector for media content ranging from sports to daily specials and in-house branded visuals. These are fed through a fully routable matrix with inputs from the Arkaos Pro server, HD Broadcast streams and live camera relays as needed. The LED dimming solution is the iLight SCLED dimming with 72 dimming circuits, LSC APC12’s provide the hot power feeds to the show lighting with full remote DMX switching control and on board voltage and amp monitoring – providing robust back of house infrastructure. Detailed planning and installation project management where essential to manage the workflow with so many integrated light sources built into the bars and fittings. We liaised closely with the project manager from Broadway Interiors and the MEP and general contractors to bring this together – with over 8km of DMX cable alone from the central rack room, the behind the scenes complexity for packing this large inventory into the space required precise advance planning and detailed hands on execution. From the outset we wanted to be sure that whilst retaining the iconic elements from the first Lock, Stock & Barrel this second incarnation had unique touches of it’s own. The expanded scale and inventory provided a larger canvas but we wanted to ensure the attention to detail was retained. There is a very theatrical aspect to the design – taking into account the interior design detail and seeking to enhance every element to ensure longevity of interest for the diverse crowd it attracts.